I look forward to seeing the guitar. I'll post the pics here too. 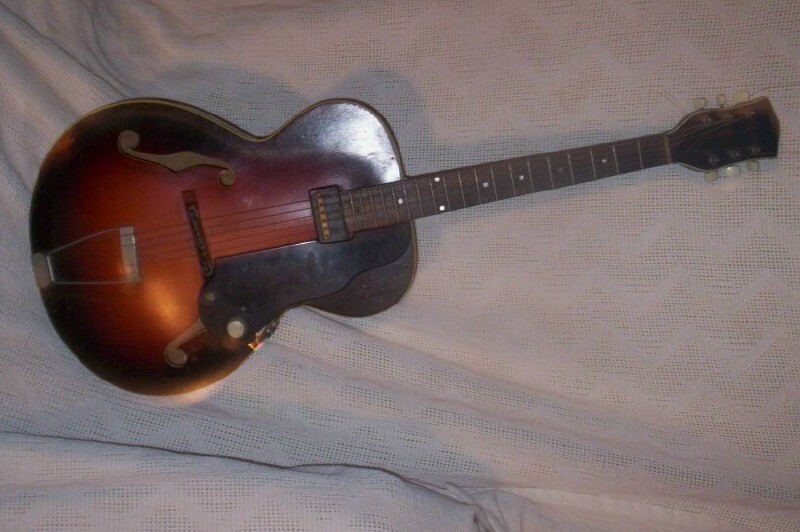 This guitar looks to me to be a version of the "New Yorker". Around this time it might have been advertised as a Model 1120. The vinyl pickups are usually found on electrics around 1952/55. This scratchplate was used mostly on the Supro version of this instrument - The "Supro El Capitan". It almost looks identical in finish and fittings to the "El Capitan" except that your instrument definitely has a National headstock not the pointed Supro type. So I would say that it is a slight variant of a usual National New Yorker . I would suggest from your serial number that it is nearer to late 1954/55 than 1953. I know that the serial number dates it around 54/55 but my mom put it on layaway in the Fall of 1953 for my dad for their first anniversary. I've been studying these instruments for around 40 years. What answer would you like me to give you? If you have different ideas don't let me stop you believing what you like. You may not be aware, but you are talking with probably the most knowledgeable person in the world on this subject. Mark has nothing to do with the running of this forum, he is a contributor like yourself. If Mark says your guitar is a particular model & year (unless you can prove otherwise), I would advise you to take his information as fact. If you took your guitar to a dealer for this information - I pretty much guarantee that (A) you would be charged a fee for the information - and (B) that it would be incorrect. The specialist area that your instrument falls into, is VERY specialized and is not understood by any dealers or so called 'experts' that I know of. If you don't belive me - phone any leading dealer and ask them about a National model 1120 or a Supro El Capitan and see what they say! Between Mark, Colin, myself and our forum members, I believe there is nowhere in the world to go for better knowledge of National guitars. Im so very sorry if I have offended you. but My mom is here with me and she knows when she bought it. Im truly sorry for any hard fealings you may have on the situation I wasnt trying to be mean I just wanted to let you know the information that I have on the guitar. My mom is here and she said she was married march 3 1952, and she bought it for my dad in 1953. Im really sorry. I will look through my moms files and find the invoice where she purchased the guitar. Thank you for the information. I really appreciate it all and Best wishes. Thanks for your private email.. I know Mark Makin really well, and don't think you have offended him or us in any way. The serial numbers from that period aren't absolute, at least I'm not aware that the Valco factory (Valco 'owned' National and other makes at that time) actually ever published a definitive list, and thus all Mark is doing is making an educated guess, based on his research. He has as far as I know the most exhaustive collection of National sales brochures of anyone in the world. Various researchers have published lists over the years, here for example is part of Clay Harrelson's page on the subject, he puts your serial #x46149 into the 1955 year..
Valco Serial Number Plates 1940-1964. Beginning in 1940, National/Valco serial numbers were on a small oblong metal plate (brass or aluminum). This plate was tacked to the back of the neck with two small brass nails. The following serial numbers apply to all Valco made National instruments, including lapsteels and guitars. These plates were also put on amplifiers. All Valco made instruments were numbered this way till 1964. Valco also made instruments for Sears (Silvertone), Montgomery Wards (Airline), Gretsch, Oahu and others. These are numbered with the same metal tag system. It is possible, and I see no reason to doubt when you say that your guitar is indeed from 1953, so don't fret about it! One possibility is that it went back to the factory for work (perhaps the neck warped?) and they fitted a newer neck at that point, or even that without telling your Mum, your Dad 'traded up' a few years later to a newer version of the guitar your Mum bought him. Pickups in particular were evolving fast at that point so if he was a serious player he might well have sought the latest upgrade. It would still have been a 'New Yorker' and to anyone but him it would probably have looked like the same guitar! If we really want to be 'picky' then if you ever have work done on it you could ask the technician to see if the volume control has a date code on it, some do. If it is 1955 then we'll have to accept that it is of that year. If earlier then the neck may not be from the original instrument. Finally some instruments had the date stamped or handwritten inside the body. A high end luthier local to you may well have a wee video camera on the end of flexible stalk to look inside instruments for damage, and you might find a definitive date that way. I took my camera and light and found the number 1125 printed in black inside the body maybe that will be helpful. The 1125 did exist, in the May 15, 1953 catalogue, it is listed as $120, and It is called the "Dynamic", regular finish, (In the blond finish it is the 1120 'New Yorker" ($135)). Pu looks different, though, and placement of Vol/tone controls. I don't have the '54 or '55 cats though.. Mark/Michael, have you? You have not offended anyone, just provoked a 'healthy' discussion! the problem with forums is that a conversation is in print and that can look more serious than it actually is. I will leave the research & identification to Mark & Colin on this one. 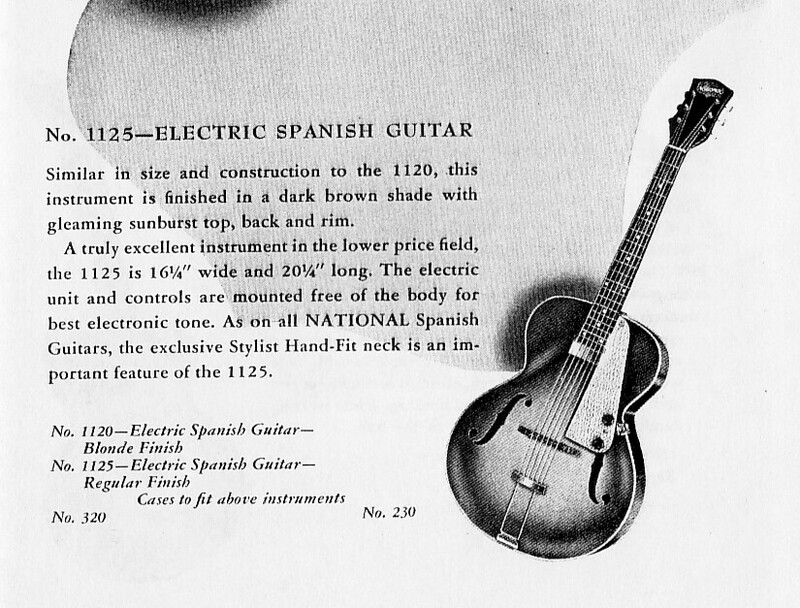 What I would like to see, not for any research reasons, (just because we love these instruments and their history), would be a photo or two of your Dad with his National guitar. Did he play it professionally or just for fun, and if so can you tell us about when and where he played? Also, as this is an electric guitar, do you still have the amplifier? As Colin explained, this is not an exact science. It seems that there are always exceptions to the rule. This is why I specifically said that your instrument was "...NEARER to 1954/55 than 53." I wish it was possible to tell you your instrument was made at 11.30 in the morning of June 23rd 1953 but it's not. Dating is usually achieved with a combination of serial numbers and specific features on the instrument that are known to come from a particular time. In your case, the pickup appears on other Nationals from 1952 -1954 and the scratchplate appears on Supros from 1954. 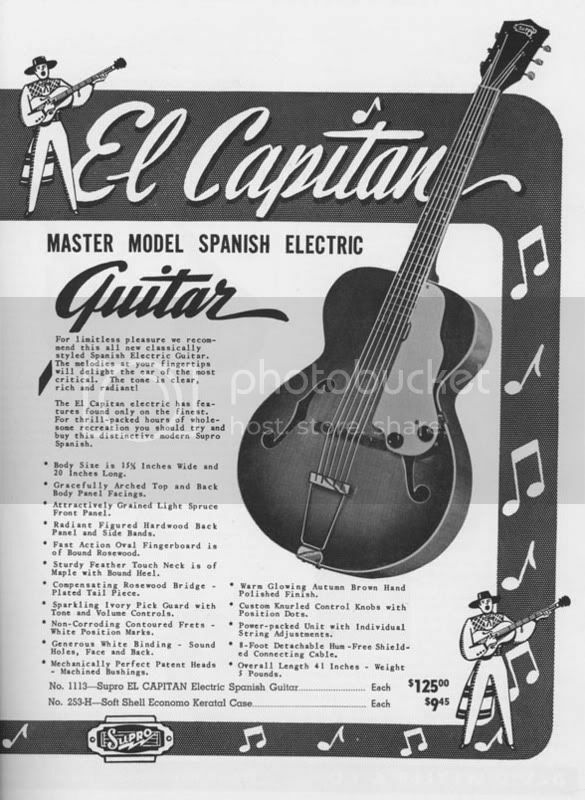 I have enclosed the catalogue page from 1954 for the "El Capitan" which, as I said, is also the same instrument (Just a different headstock shape). I think you have discovered all the facts necessary yourself - you have a family connection to the end of 1953 with the instrument and it also says "1125" inside. That is about all there is to say. Like I said at the beginning - it's a National New Yorker variant from around 1953 to 1955.
thank you guys, my mom is pleased to know that she isnt crazy ;D I really appreciate your help on this matter. any idea of what kind of insurance value it may have at this time?